These scallion pancakes are a wonderful appetizer dipped in soy or other sauces. 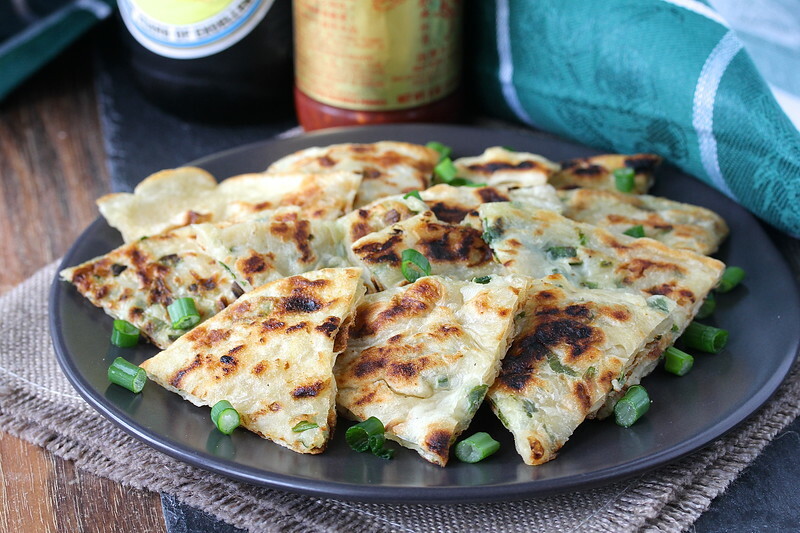 Chinese Scallion Pancakes are made with unleavened dough rather than batter, and are flaky from layers of thinly stretched out dough that is filled with scallions. 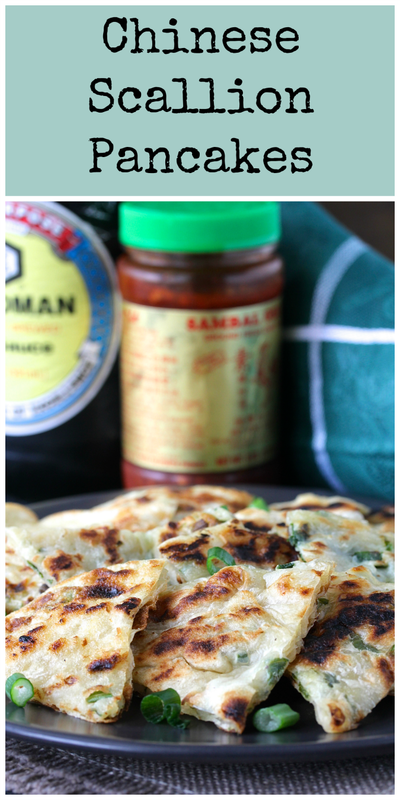 I have always wanted to try making these scallion pancakes, so when Mayuri of Mayuri's Jikoni, our Bread Bakers host blog for this month, came up with the theme, pancakes from around the world, I jumped on it. By the way, you will not believe the line up of pancake recipes! If you are a fan of international foods, you definitely need to check out all of the links after the recipe. Scroll all the way down. Pretty amazing. Thanks for the inspiration Mayuri. 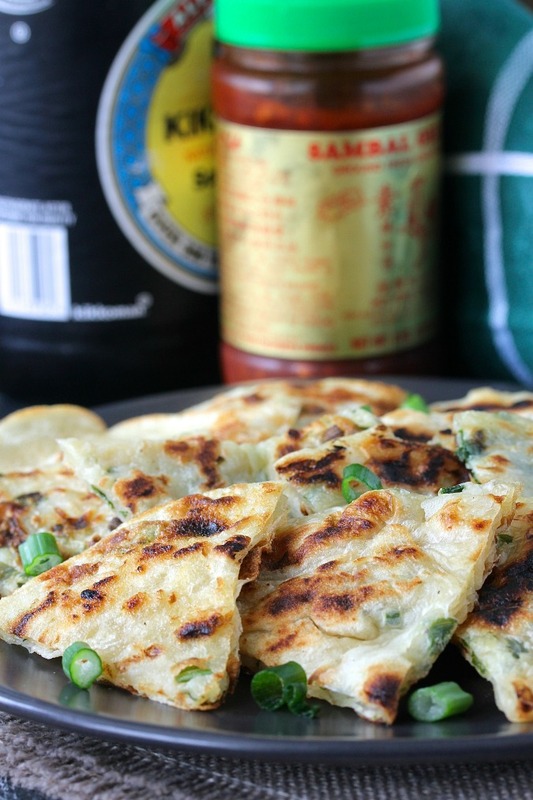 These scallion pancakes are delicious served immediately, with chili sauce or a soy and vinegar dipping sauce (recipe below). The flavor from the scallions, sea salt, and toasted sesame oil is wonderful. By the way, while every recipe I found said that they should be served right away, I found that reheating leftovers in a dry frying pan (a trick I use for leftover French fries) revived them beautifully! While some recipes call for using a rolling pin, I used my oiled hands to stretch out the dough on a Silpat. Feel free to give a rolling pin a try if it works for you. I find that I can get the dough thinner by using my hands. Don't worry if the dough tears. When you roll it up, no one will know. Also, some recipes for these Scallion Pancakes call for sugar, but I decided to leave it out so that I could fry these a bit longer without burning them. This recipe calls for two kinds of oil, toasted sesame oil, and peanut or vegetable oil. The sesame oil, which is lightly spread over the layers of dough, adds a wonderful flavor, but is not a great oil for frying. The peanut or vegetable oil has a high smoke point, perfect for frying these at a high heat. Mix the flour, water, and pinch of salt in the bowl of a stand mixer or a food processor. 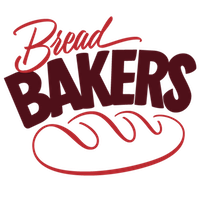 You can also knead this dough by hand. The dough should be smooth and elastic. Spray the dough with spray oil, or rub it with oiled hands. Let the dough rest, covered with plastic wrap, for about 30 minutes. Divide the dough into 8 equal pieces. Lightly oil a Silpat or your counter with oil, and, using your oiled hands, press and pull the dough out as thinly as possible into a circle. With your hands, rub the dough with sesame oil, and sprinkle with 1/8th of the scallions. Sprinkle lightly with the kosher salt. Rub your hands with sesame oil and roll up the dough into a log. Coil the log like a snail, and then flatten it with your hands into a 6 inch disk. Heat a wok or heavy frying pan on medium high and add a tablespoon of peanut or vegetable oil. When the oil shimmers, place the flattened dough in the pan, and fry on one side, one to two minutes, until browned. Flip and cook on the other side until browned. Place the finished pancake on paper towels. Repeat with the rest of the pancakes, adding more oil as needed, until finished. Serve with chili sauce or a soy vinegar sauce. To make the soy vinegar sauce, mix 3 tablespoons soy sauce, 2 tablespoons of Chinese black vinegar or balsamic vinegar, 1 teaspoon of sesame oil, and a some chopped scallions. I've also dipped these in Korean Gochujang. Delicious. I have been wanting to make scallion pancakes Karen. I'm so glad you shared this recipe with all the tips so that I have a head start when I go to make them. Hope you like them as much as I did! They're so good! We would love these pancakes. Scallion with the Chinese sauce sounds delicious and they are so pretty too. I think they would even make a great appetizer. They are a wonderful appetizer Julie! thanks so much! 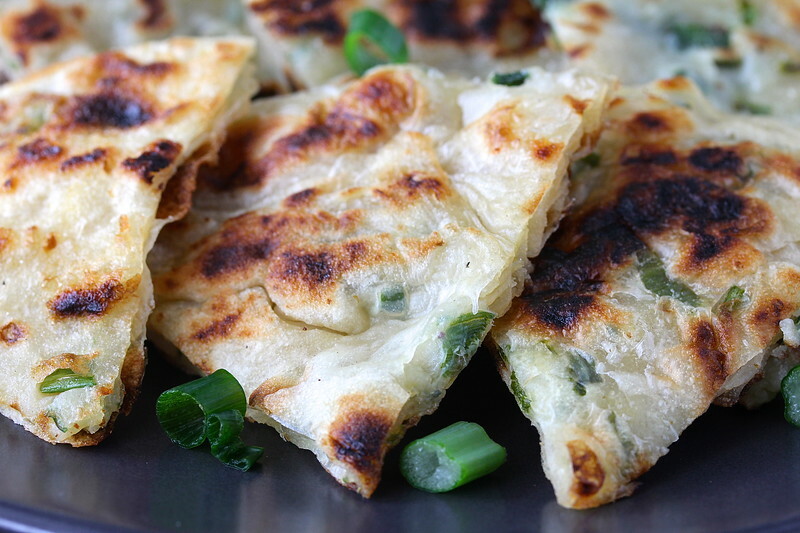 Those scallion pancakes look absolutely perfect -- flaky, soft and delicious. It's a revelation! Way better than the oven or microwave! Tzatziki sounds perfect!! I need to try that combo too! These different sort of pancakes look just so yummy Karen. I could eat this whole batch myself. These are amazing and something I've only ever enjoyed at a restaurant. Now I can think about making this at home too! I'm so glad I finally tried them. They've been on my list for a long time. 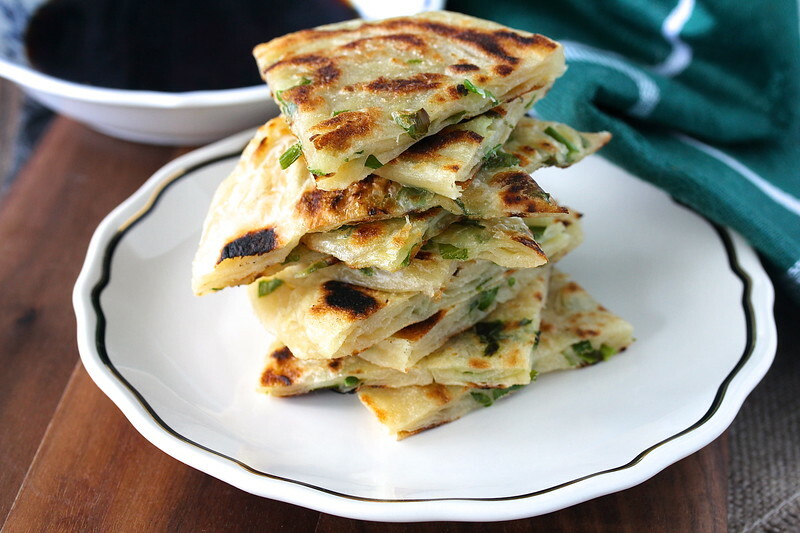 I LOVE these scallion pancakes. You made it so well!! Can't wait to make them myself again!! I heard of these pancakes but never tried them. Thanks for the tip to lightly spread sesame oil for flavor. The sesame oil adds such a nice flavor! Lovely pancakes.... Looks like a perfect weekend breakfast for me... Thanks for sharing. Oh yes! That would be delicious. Thanks Shilpi! 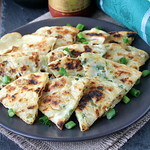 Hello Karen, Scallion pancakes look so delicious and flavourful. This recipe is bookmarked for sure. Thanks for sharing.